and those with disabilities in developing countries. Gallaudet's Department of Education, established in 1891, is an American Sign Language/English bilingual, diverse, multicultural learning community devoted to preparing teachers, researchers, educational leaders and international development advocates. The department boasts a faculty of experienced, innovative teachers and scholars, many with national and international reputations in the education of deaf and hard of hearing students. The Department of Education established in 1891, is an ASL/English bilingual, diverse, multicultural learning community devoted to preparing teachers, researchers, educational leaders, and international development advocates. Using a transformative framework the students are mentored to enhance critical thinking, obtain experiences with interdisciplinary connections, explore multiple social and professional identities, and assume social responsibility. Our mission is to promote the intellectual, linguistic, and social potential of deaf and hard-of-hearing individuals and the creation of systems oriented toward social inclusion at home and abroad. 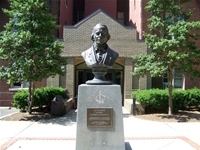 In compliance with program accreditation, licensure and certification requirements, and state and federal mandates for high quality teacher preparation and the dissemination of research-based educational practices, the mission of the Gallaudet University Department of Education is to nurture and mentor pre- and in-service teachers, teacher educators, clinical supervisors, educational leaders, and classroom-based agents for change. Toward this end, roles and responsibilities of Department faculty members include: (1) the art and craft of teaching, including the modeling of educational content, strategies, and performance assessment, student advisement, and curriculum building and revision; (2) research and the dissemination of knowledge through publication, and other creative endeavors; and (3) a commitment to service through a variety of activities at local, national and international levels. For more information about the Department of Education, please contact us at: education@gallaudet.edu. The Department of Education at Gallaudet University is hosting an accreditation visit by the Council for the Accreditation of Educator Preparation (CAEP) on October 20 - 22, 2019. Interested parties are invited to submit third-party comments to the site team. Please note that comments must address substantive matters related to the quality of professional education programs offered, and should specify the party's relationship to the provider (i.e., graduate, present or former faculty member, employer of graduates).